I’m not here to put cow’s milk on blast. (In fact, we’re proud to offer you the best dairy products — like milk, cream, cheese, and yogurt — from local producers doing things the right way.) Instead, I’m here to introduce you to the wonderful world of non-dairy milks, which have enjoyed a 61 percent jump in U.S. sales in the last half decade or so. Let’s demystify all the options and figure out which ones deserve a place in your fridge. First, a little secret: you don’t have to be dairy-free to enjoy the wide selection of alternatives available today. Perhaps a family member has a milk allergy or is lactose intolerant. Maybe you want to experiment with different flavors or textures. You may also be looking for specific nutrients. And because non-dairy milks tend to be better for the planet (no animals means no methane production), you might be tempted to give these a try for environmental reasons. 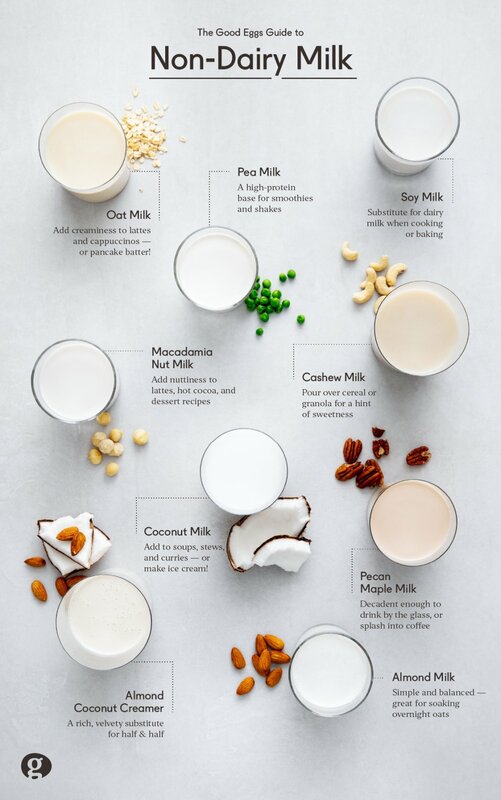 Either way, here’s everything you need to know to easily incorporate plant-based milks into your beverages, baked goods, and everything in between. The OG of non-dairy milks, soy milk surged to popularity in the early aughts, stymied only by the rise of other trendy alternatives, like oat and almond milk. But I have a prediction: as one of the more nutritionally-sound milks (it has lots of protein and calcium), soy milk is poised for a resurgence — expect it to start trending again soon. It’s also incredibly versatile. Substitute it cup-for-cup for dairy milk in recipes, use it as a base for smoothies, pour it over cereal, or drink it by the glassful. If you’re looking for a pure replacement for cow’s milk, this is it. Almond milk tends to be less nutritious than soy milk, but that’s not always the case. 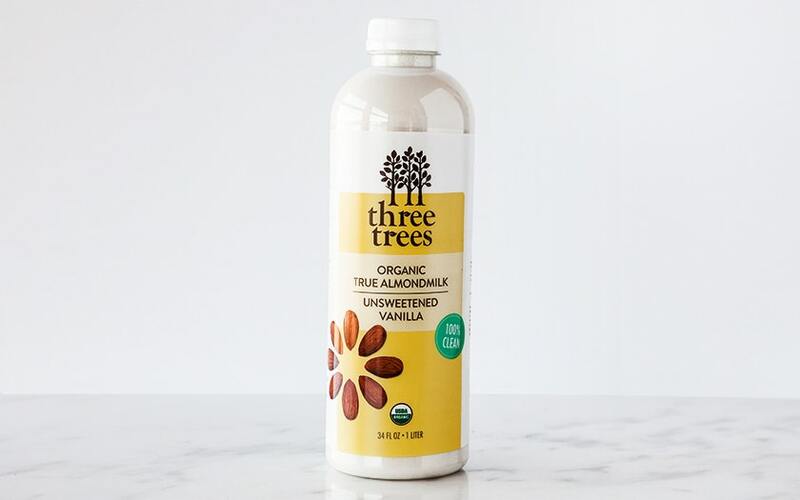 Based just down The 101 in San Mateo, Three Trees packs so many organic almonds into their milk, it has nearly as much protein as soy milk — and more calcium. They use whole almonds (the only ingredient besides water) so the fat rises to the top, resulting in a non-dairy expression of cream-top milk. Almond milk is especially good in coffee, tea, baked goods, and for soaking overnight oats. I’ve been drinking oat milk for six years — everyone else is just late to the game. The present-day darling of non-dairy milk, its popularity comes from baristas gushing over its creaminess. Those baristas know what they’re talking about. Oat milk is spectacular for crafting foamy lattes and cappuccinos. With a mouthfeel similar to cow’s milk, it’s a great analogue, so go ahead and pour yourself a glass. It’s also right at home whipped into pancake batter or added to creamy soups. I know, I know — I’m still getting used to the name, too. But pea milk is for real. It’s higher in protein than other non-dairy milk and has more calcium than cow’s milk. Ripple fortifies their pea milk with algal oil, which is full of healthy Omega-3 fatty acids. An eco-friendly bonus: peas require little water to cultivate and pull nitrogen from the air into their roots, restoring soil health. Pea milk is rich, creamy, and a good high-protein base for smoothies and shakes, but you can use it just like regular milk, too. Try a glass of the chocolate flavor after a run or workout. There’s hardly any domestic production of macadamia nuts, so finding a macadamia milk producer whose labor practices meet our standards was a challenge. But we did our due diligence and we’re proud to carry Milkadamia. They grow all their nuts on a family-owned farm on the eastern coast of Australia within the native habitat of macadamia trees. Creamy, subtly sweet, and nutty, macadamia milk is great in lattes, hot cocoa, and dessert recipes — especially if you’re a fan of the nuts themselves. Looking for a kid-friendly alternative to cow’s milk? Forager Project’s Organic Original Unsweetened Coconut Cashewmilk is a delicious blend of cashews and coconut cream that will appeal to kids’ taste buds without overpowering them. More importantly, growing bodies will benefit from its full-fat nature (don’t worry — that would be the good kind of fat). Looking for lighter, lower-fat options? Try the original and unsweetened versions. I like cashew milk poured over cereal or granola for a hint of sweetness. However you decide to use it, cashew milk is more subtle than other non-dairy milk and unlikely to overpower other flavors. Having ridden coconut water’s coattails to popularity, coconut milk (which is made from the meat of the coconut whereas the water is just the liquid inside the fruit) is refreshing and versatile. It’s a good way to add coconut – which has been trending as a flavor for some time now – to just about anything. So if you like coconuts, you’re probably going to like coconut milk, and vice versa. Try using it as a lighter alternative to full-fat coconut milk (which usually comes in cans) when cooking soups, stews, curries, and Asian-inspired dishes. It really shines in frozen desserts, too — especially ice cream! Pecans are native to the U.S. and full of antioxidants. They’re especially nutritious when they’re sprouting and cold-pressed, like the nuts that go into Malk’s pecan milk. Add a touch of real maple syrup and vanilla (actually, Malk does that for you) and you have a decadent treat you’ll be tempted to gulp by the glassful — which I’ve been known to do. I also like to add Malk’s pecan milk to coffee and smoothies, especially when I want some extra sweetness. Just remember that if you cook with pecan milk, high heat will destroy many of its unique nutritional benefits. You know those ubiquitous little cartons of half and half (a mix of milk and cream) that accompany cups of coffee at diners and restaurants? In this, the golden age of milk, you have other options. One of my favorites is Ripple’s Plant-Based Half & Half, which uses many of the same ingredients as their pea milk. The result? No saturated fat, an impressive dose of omega-3s, and a crazy amount of protein for a creamer — almost as much as regular half and half! Nutpods Plant-Based Creamer is another go-to. It has an even simpler ingredient profile that includes coconut cream, which adds a velvety richness to your coffee or tea (which is where you should use both these products). If this list has convinced you to make the complete switch to plant-based milk, go for it. But honestly, these alternatives are just as useful as supplements to the milk you already drink. Use my suggestions as a jumping-off point to experiment and find the ones that work for you and your family.